Having been established in 1942, the company specialise in Telescopes, Binoculars, and other Optical products. As well as being one of the UK's Premier Optical Specialist retailers the company has now also turned its attentions to stocking a wide range of eclectic giftware & gadgets from some of the UK's leading companies. We are dealers for Meade, Skywatcher, Celestron Astronomical Telescopes and Accessories. We also offer a large range of Binoculars for both Bird Watching and Astronomy. If you are looking to purchase product from the showroom please contact us first before making a journey to check stock on 01789-488880 as some of the goods listed on the web site are shipped direct from the respective manufactures. 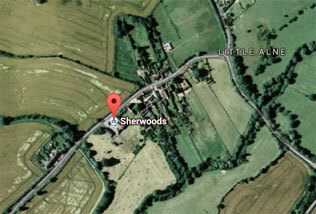 We are located at the Arden Centre, Little Alne located just outside of Wootton Wawen on the B4089. Click the map on the left to open up google map screen to get directions.  Orders can be placed for all items on our web site. If you wish to order online we use the latest encryption to ensuring total protection against fraud.  All orders placed on line will be confirmed by e-mail.  On despatch of the goods an e-mail will be sent. • Goods Shipped Via DPD Local are given a delivery window on the morning of delivery by e-mail / Text, this enables the driver to advise you on a Delivery window. Orders can be phoned through to our sales office, place you order over the phone, by giving your card and delivery details. Orders can be Faxed direct to our offices, print your order summary, fill it in and Fax your order to us. Orders can be Posted direct to our offices, print your order summary, fill it in and Post your order to us.  Postal Order made payable to 'Sherwoods Photo Ltd' All prices displayed on our site are inclusive of VAT at the current rate. All credit/debit card transactions are subject validation checks and authorisation by the card issuer.  Bitcoin - Please contact us for link details. If your chosen method of payment is by cheque, we will not despatch your order until our bank has notified us that payment has cleared. This can take up to 7 banking days. Please write your name and address on the back of your cheque and include a covering letter detailing your order. Price Match / Can we do a better price ? We try our hardest to offer the most competative price but sometimes goods are out there somewhere cheaper ! In the event you manage to find a better deal than the one shown on our website please let us know, as long as it is brand new, unopened, UK stock (Not a grey import) then we will try our best to match the price. To enable us to check for you we need the following information.  Heavy & bulky items are shipped via DPD Local and is fully insured against loss or damage while in transit. DPD Local is one of the UK's leading time-critical carriers They offer pre-delivery notification to a mobile or E-Mail address giving a 1Hr delivery window for most areas. Royal Mail :- Small items will be shipped to you using Standard Parcel Post or Standard Mail (Delivery Times subject to post office ) and is insured against loss or damage while in transit. Should you find it necessary to return goods for an Under Warranty repair please contact us first via e-mail to request a reference we will then advise on the best way to return the item. Please ensure that items are safely packaged we cannot be held responsible for goods returned damaged or lost while in transit. We will compensate your return postage costs for warranty repairs ONLY within the first 14 days, after that period the customer bears the full cost of return postage. We will only refund the costs of the return transit when the method used was as advised by us. Goods found to be defective and under warranty will be shipped back free of charge either from ourselves or from the Manufacturer/Distributor. Please note that any goods returned back to us which prove to be non defective will be returned and the returned shipping cost will be charged at cost. If you are requesting an exchange of product (other than because of an error by us) then we reserve the right to charge you an additional delivery cost. 1. EU residents pay the VAT inclusive price (VAT at appropriate rate, currently 20%). 5. Goods offered subject to being unsold. In the event of non-availability of goods, we reserve the right to rescind the contract. 6. All goods remain Sherwoods photographic property until paid for in full. ... (You will be informed of any changes in the quoted price prior to entering into a contract). 8. Claims for damage, non-functionality and mis-shipping must be made within Fourteen days of receipt. 10. All returns must be in stock condition and be authorised by Sherwoods Photographic. 11. You are responsible for ensuring safe delivery of the returned item. 12. Goods returned for repair that show no fault will be shipped back and a charge for shipping & handling will be made. 13. If part of these terms is found to be unlawful, it shall not affect the validity of the remainder. 14 These terms and conditions do not affect consumer statutory rights. 15. Errors and omissions excepted. 16. Orders made for any products or services displayed on this website, including prices, do not constitute an offer to enter into a contract or agreement. Your order is deemed to be an offer for the products or services selected and Sherwoods Photo Ltd is not obliged to accept your order. 2. Give as much information regarding the nature of your complaintIn return we promise that any problems/queries raised will be handled fairly and in complete confidence within a five working day period. As a consumer purchasing mail order under the 'Under the Consumer Contracts Regulations' you are entitled to a 14 day cancellation period. This regulation gives you the right to return the goods ordered in an as new condition with all packaging, instructions etc, without the need to give reason within 14 days of receiving the item (starting the day after receipt), and by doing so to receive a full refund within 14 days of the goods arriving back to Sherwoods, (excluding the cost of returning the item). The 14 day cancellation period is not applicable to Computer Software. If you wish to return goods under the above terms please contact Sherwoods to inform them of the return so that we can process you refund as quickly as possible. Refunds on goods returned will where applied include the cost of any outgoing delivery charged. We accept payment by Visa, MasterCard, Amex, Maestro and Debit cards, Cheques and Postal Orders. Orders made for any products or services displayed on this website, including prices, do not constitute an offer to enter into a contract or agreement. Your order is deemed to be an offer for the products or services selected and Sherwoods Photo Ltd is not obliged to accept your order. Sherwoods Photo Ltd has created this privacy statement in order to demonstrate our firm commitment to privacy. The following discloses our information gathering and dissemination practices for this website: www.sherwoods-photo.com. Your IP address is used to gather broad demographic information. This site contains links to other sites. Sherwoods-Photo.com is not responsible for the privacy practices or the content of such Web sites. Our site uses an order form for customers to request information, products, and services. We collect visitor's contact information (like their email address*) and financial information (like their account or credit card numbers). Contact information from the order form is used to send orders to our customers. Financial information that is collected is used to bill the user for products and services. Used when the customer clicks on the 'remember my details for next time' option on the checkout. used to tell if a cart has been abandoned. All Prices, availability, appearance, product descriptions, and accessories are based on available manufacturer information and are subject to change without notice. All logo's and Trademarks remain the property of the respective manufactures or companies.